Let us help you share sepsis information and resources with your patients with this easy-to-customize bundle of materials. From sepsis information guides on different infections and conditions that can lead to sepsis to an overview of post-sepsis syndrome and answers to common questions about sepsis, we want to arm you with the tools and resources to educate your patients. This new nursing education tool, Nurses Suspect Sepsis, is a 20-minute video perfect to share at your next continuing education or staff meeting to refresh staff on early identification of sepsis. Complete with an overview of sepsis symptoms and stages, medical staff will be empowered to recognize early warning signs of sepsis and know interventions and therapies to treat it. Watch the video below and download here. Get access to our library with more than 20 guides with specific information on sepsis and a variety of conditions – including post sepsis syndrome, diabetes, pneumonia, UTIs, and more. These are great for sharing with patients who have experienced a combination of sepsis and these conditions. 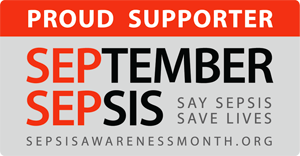 Add this graphic to your website for Sepsis Awareness Month to show your support. It’s a great way to share your own and Sepsis Alliance resources to educate patients and raise awareness. Share these sepsis stats and facts with your friends and followers on social media to help spread the word about sepsis. You can even update your Facebook profile picture with our Sepsis Awareness Month filter and add a Sepsis Awareness Month cover photos to raise awareness. These eye-catching stats are perfect to share on social media or your website. Stock up on materials for Sepsis Awareness Month from brochures and symptom cards to table covers and t-shirts. Donations and support help Sepsis Alliance continue to provide resources and raise awareness for sepsis. 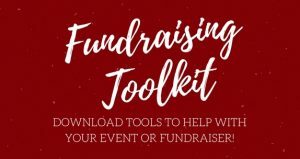 Here are a few ideas to get you started with your own fundraising campaign. How do I order brochures? How can I print a poster? Can I share Sepsis Information Guides with patients? Answers to these common questions and more can be found here. Many of our sepsis resources, videos, and information are available in Spanish, as well. Find them here. Video and Radio Spots on Sepsis Awareness.